It’s a man eat man world. 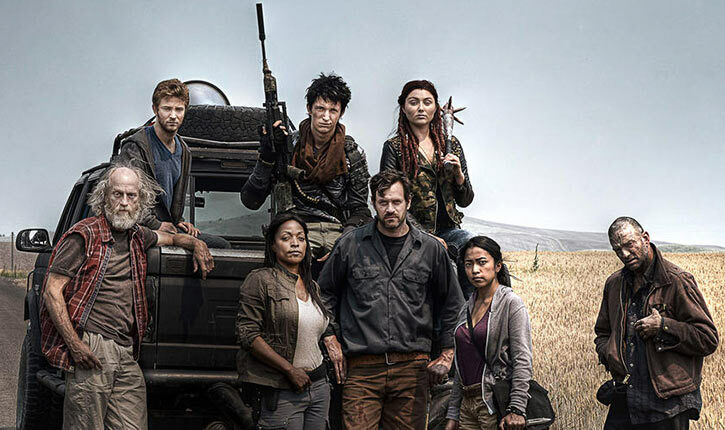 Z-Nation is another big TV-show aired by Syfy and produced by The Asylum. Four seasons have currently been produced since 2014. The world as we know if is no more. It’s a (zombie) man eat (human) man world now. Choose your side, and join the mission because where there is life, there is still hope. The show takes a fun, weird approach to the zombie apocalypse (in contrast to The Walking Dead). It tries every possible idea at least once! Real Name: Steven “Doc” Beck. Known Relatives: Son (name unrevealed), ex-wife (deceased). Height: 6’2″ Weight: 160 lbs. Age: 58 years in Season 4. Doc acts as the group’s medic, but he is not a real medical doctor. Rather, he was a therapist pre-apocalypse, and a dedicated fan of the ER TV show from where he learned most of the trade. From having led a wild hippie life earlier, as well as his later profession, he is knowledgeable about various drugs and medicines. He can now also perform simple medical procedures. As a fighter, Doc is much more durable than what he looks. He has survived some really bad punishment (being blown up, being irradiated, having been exposed to toxic gas, having been hit viciously, etc.). He expertly wields a pair of hammers, his melee weapons of choice, for pummeling the zombies. He is also a fairly good marksman when needed. Beck used to be a hippie, and had traveled around a lot in the United States of America. But in modern times was working as an ex-addiction councelor, and apparently doing a great job at that. He has a son, that still could be alive out there somewhere. When the apocalypse started, he was working as usual. But as his colleagues and patients started going crazy and eating each other, he quickly realized they had become zombies. He somehow managed to get out alive, perhaps thanks to his alleged earlier experience in the Navy. But little is known about the period immediately thereafter. He also survived the hard years called the Black Summer (no relation), of which little is known in detail. Three years after it all had started he joined a group of people, as their unofficial doctor. These took on themselves the greatest possible mission: the salvation of mankind. The group has consisted of a few different characters, as some died and others joined. It is called Operation Bitemark and took on the task of transporting Murphy, the only human being alive immune to the zombie bites. Murphy’s blood is expected to produce a vaccine, thus saving mankind. If they can just transport him to the last working biochemistry lab in California. 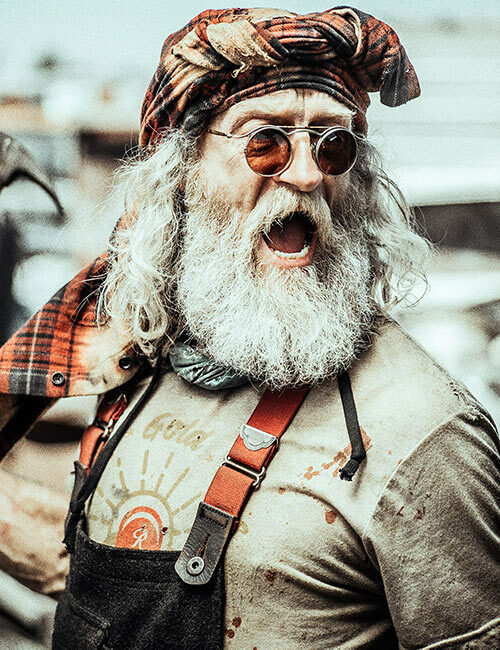 Over the years, Doc underwent many insane adventures in the post-apocalyptic world. Still, eight years after it all started he is still going strong, and still joining into worthy causes for mankind. Never mind what’s after 5:50. Bonus video – the Grand Canyon strategy! Zombies of the Apocalypse, or Zompokalypse now! 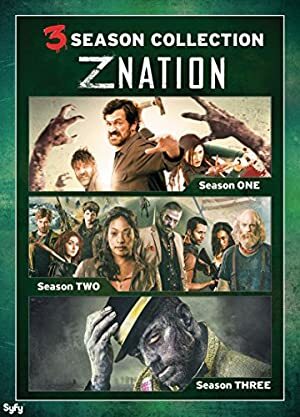 In the world of Z-Nation there are not only one single type of zombie. Different circumstances have produced a number of varieties. A few specifics are given below. What will they think of next? These are either slow (and low on energy, which usually occurs with “age”) or fast (and capable of running as fast as any human if they are fresh). Practically all types of zombies are permanently killable by a headshot, headstab or beheading (=destroy the brain, destroy the zombie). All zombies are attracted by sounds of all types, and the smell of human, and their greatest “desire” is to eat all humans. Humans killed thusly become zombies themselves only seconds thereafter. Even being bitten by a zombie will lead to a horrible infection (treat this as a gradual Poison Touch attack) that will slowly lead to death (and zombie animation). 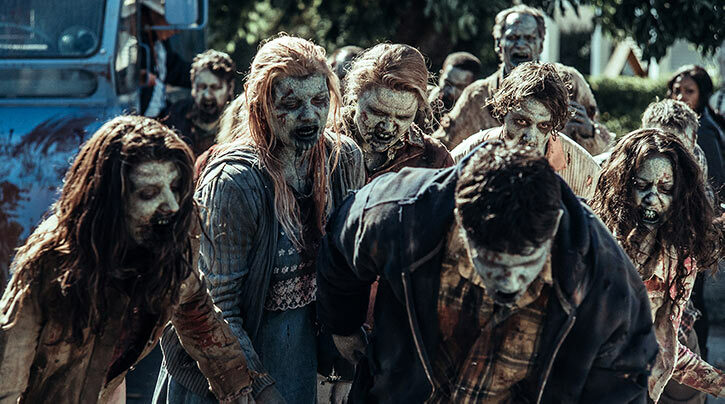 A standard zombie will roam the lands for humans far and wide, but will eventually die permanently of starvation, although this takes many years (10-20 years or so by the estimates made by some researchers at the outpost of Zona). When hungry enough some zombies will attempt to eat other zombies, and even a ball of zombies trying to eat each other constantly has been seen rolling around! Dodge if it heads your way! And if you ever planned on going to the Grand Canyon for some sight-seeing, forget it, it’s now filled to the brim with zombies! But Doc was never near it (or so he says)! These were standard zombies, but still carried their firefighter helmet from living days, and so were trickier to destroy! Created around a nuclear detonation, these odd mutant zombies move at superhuman speeds. They can outrun even a car. In game terms, they actually have 5 or 6 APs of the Superspeed power. Furthermore, they are immune towards Murphy’s zombie-controlling powers. This same immunity has been seen also with some other rare zombie groups. Blaster Zombies even seem to employ some tactics, dodging, regrouping etc. in fights. Some of their representatives were wearing suits, but they were running around on all four like some inept, common zombie! Bad Robot? No, Bad Zombie, I say! At an old medical institution could be spotted roaming zombies. These were clearly suffering either from a condition or the effects of a drug (presumably but not necessarily imbued in life). These included some very nervous zombies meandering about back and forth at high speeds, and some Viagra zombies (don’t ask!). These odd zombies became radioactive and glowing as they were active around the strongly radioactive area of a nuclear power plant (and its core). The mere contact with one of them will lead to eventually lethal doses of radiation damage. Better start poppin’ those iodine pills, baby! Yes, zombie babies crawling around at dangerous speeds and purposes have been spotted. Not to be cuddled with! In a few eye-catching scenes, a number of specific religious groups zombies have been seen. This includes Amish zombies, Mennonite zombies, and Mormon zombies. Collect all three, as Doc would say. And then came Catholic Nun zombies! Through some oddity there are zombies on which plant life grows. They can be stuck in vegetation and part of that vegetation, or walk around looking almost like living plants, and by necessity they are slow, but generally powerful. They may have been an offshoot created when zombies were used as fertilizer for growing weed! An Inuit zombie was spotted on one occasion, but it was frozen stiff in Alaska. It was sleighing along an unaffected husky dog, which thus became the best friend of Citizen Z.
Amusingly, we have seen a bus-load of Abraham Lincoln impersonator zombies! Also, clown zombies (yeah, that’s a bad combo! ), parade zombies, and pigtail-wearing cheerleader zombies have been spotted. A collector of zombies also kept the zombie of George R.R. Martin in his museum. A group employed zombies as attackers by binding dynamite around them and sending them towards enemies to blow them up, whipping them forward no less. Go, boy, go…. kaboom! Around Area 51 could be spotted zombies that also appeared to be genuine alien beings. Really?! A zombie-grafting onto human-experiment gone awry. A zombie hand attached to Dr. Kaligari slowly took over the human host, changing it into something half-dead, half-alive. After five years, the resulting huge humanoid zombie thing had four arms, with the face of his assistant whose zombie hand it had been. It an extra face on its chest, and Dr. Kaligari’s own talking face on the back along one working hand! The lower pair of arms could handle a submachinegun just fine, or just punch opponents. Zombie powers with street smarts – lethal combo! Yes, animals can be zombies too! Sheep zombies, bear zombies, rat zombies, dog zombies and wolf zombies have been seen, and fought at various locations. Note that they are not suitable trophy animals! Introduced in Season 4, the zombie virus has mutated and some new zombies are now much worse than before! They are no longer permanently killed by a simple headshot, headstab or decapitation. These zombies are only temporarily stunned, lying down “resting” (and treacherously appearing permanently killed) for a while the first time they have suffered enough damage to kill a standard zombie. But soon enough they rise again, seemingly even more durable and faster than before. Then keep on moving until they have more or less been pulverized or disintegrated by physical damage. In game terms they then have a much higher BODY score than standard zombies. Treat these as standard zombies, already with one AP higher BODY score from the start. Then once they have been seemingly destroyed, raise them up again soon, and this time with even higher DEX and BODY scores along loads of Damage Capacity. As if this wasn’t bad enough, they are also smarter than average zombies (with one AP higher INT score! ), can in time maneuver around obstacles and even track a human target over many miles if needed. Post-apoc survivors see them as generally unkillable and refer to them as Mad-Zs. Even one of them can pose great problems for a group of veteran fighters! While not zombies, this group merits mention. They are post-apocalyptic human survivors who have lost their minds completely and behave like crazed animals, with little regard for their or their fellow’s safety. They’ll just go on the attack screaming (think Ghouls from the Fallout games). It is impossible to communicate or reason with them, and they are also cannibals (and even eating zombies! ), clad in truly post-apocalyptic mismatched gear and usually wielding melee weapons. Doc is a tall and somewhat lanky elderly man. He is in great shape and has a large white beard and long white hair. He is usually seen in relaxed, hippie-like clothing and on occasion dons a pair of red glasses. He carries two hammers, a bag and a sidearm at most times. Doc is quick witted and wise, and actually funny. Being the most chatty one in the group he has the greatest one-liners in the show. Doc is usually also the voice of reason in any group he is part of. He has some hippie tendencies, but this aspect is often exaggerated by others; sometimes he is referred as such by strangers meant as an insult, but he just shrugs his shoulders at that. Still, when something extraordinarily weird happens, and this is not uncommon in their world, he initially believes that he is having flashbacks, until someone else sees it too. Surprising him is not easy, as he believes in most conspiracy theories, has seen some truly odd things, and lived to tell the tale. This ex-addict now works by the side as a drug dealer, but this has become less recreational (usually Marijuana or Oxycontin) and more medical over time. He sees 10K as the son that he never had, respects Warren’s authority and leadership, enjoys verbal banter with Murphy, and and is friends with Abby, and similarly on friendly terms with Charles Garnett, Mack Thompson, Sgt. Lilley, Sun Mei, Lucy Murphy, and Cassandra. But he could never figure out Javier Vasquez or Hector ‘Escorpion’ Alvarez. He is considered an asset also by Citizen Z, the coordinator of Operation Bitemark up at the Northern Light Listening Post in Ellesmere Island, Canada. Interestingly, he knew Sketchy and Skeezy, possibly the two greatest conmen of the Post-Apocalyptic world far back. Now and then, he happens upon old acquaintances, and generally he has no specific enemies. He is, in fact, a great team player, and has a good heart. He has little understanding for unnecessary cruelty, insanity, and evil. While sometimes loosing heart and hope, he usually soon bounces back up more dedicated than ever before. Doc can survive very well on his own as well if needed, but, as he so often says, he hates it when the team splits up. There is no doubt that Doc will fight to save what’s left of the world to his very last breath, and that he is a valuable asset to his compadres. Doc is fitting as a post-apocalyptic fighting rookie doctor in a number of settings. In an isolated area of the world of Kamandi fighting the intelligent animals, or the Endworlds books fighting the Doctor. Or fighting the Traitor General on Nu-Earth along the Rogue Trooper (who is blue just like Murphy used to be!). Expertise (Pharmaceuticals, Psychology), Familiarity (zombies, zombie types and behaviors), Schtick (Paired weapons: hammers). The survivors of Operation Bitemark (the leader Lt. Roberta Warren, Thomas aka. 10K, Addison ‘Addy’ Carver; all High), Simon ‘Citizen Z’ Cruller (High), Alvin Bernard ‘The Murphy’ Murphy (Low; High from Season 4 onwards), Sketchy and Skeezy, post-Apocalyptic con-men at large (Low). Medicinal Bag [BODY 01]. Doc will usually carry around a bag of medication of various sorts, including oxycontin and Z Weed (i.e. Marijuana fertilized by zombies) and whatever else he can scavenge. He has enough stuff in it to be able to adminster the First Aid subskill, and sometimes also the Medical Treatment and Surgery subskills. Hammers (x2) [BODY 04, Enhance (EV): 01 (cap is 04), Descriptor: Blunt]. This is Doc’s preferred melee weapon for destroying zombies. Due to the lack of ammo, he has instead become a proficient expert at fighting with a pair of sturdy hammers. Some sort of standard firearm (gun or rifle, sufficiently powerful to put down a standard zombie by a headshot). It varies from adventure to adventure depending on what can be found, and naturally is ammunition also very scarce (say one or two full clips only). At the end of an adventure, or even in the middle of it, he may have spent all available ammo, but he may mysteriously have new ammo packs and stuff already during the ongoing episode if he spends 5 HPs to replenish and regenerate all his gear. Z-Nation episodes play out just as if it were a role-playing game session. There is lots of post-apocalyptic hilarity and insanity going on with every concept tried and tested. There is also a clear long-term end-goal in mind, with each episode constituting a single adventure per se. Characters come and go; when someone dies, another character joins the team with little introduction or rhyme or reason (perhaps the same Player’s next Character). And sometimes characters are just away on their own missions (did Addie Carver’s player just move away or what?!). After each episode, i.e. adventure, reward the survivors with their respective Hero Points Awards. Replenish and regenerate all Equipment the characters may have paid HPs for (including ammo) between episodes. In Doc’s case it means he will always have access to his hammers, his bag of medicine and a firearm with a limited amount of ammo. Doc’s fighting skills improved slowly over the series as his very survival depended on it. At Season 4, which was some eight years after the Zombie Apocalypse (Zompokalypse for short) he was up to the current impressive Firearms and Melee subskill levels listed in this writeup. If an earlier version of Doc is to be used these can be lowered down to a bare minimum of 3 APs. Neither did he have the Paired Weapons Schtick until Season 4, which is set two years after Season 3, during which the world got even worse, and Doc grew to the occasion. Also, his HPs were set at around 10 only when the show started until they rose up to the current levels in Season 4. Doc hits much harder than what one would expect of a man of his size and stature (in fact, all the team does). This is represented by the Martial Artist (EV) subskill. While Doc does get very nervous in some zombie situations, and who wouldn’t, he is a fairly good candidate to have the Iron Nerves Advantage as well. Give him this if you wish to highlight this aspect of the character. By Dr. Peter S. Piispanen. 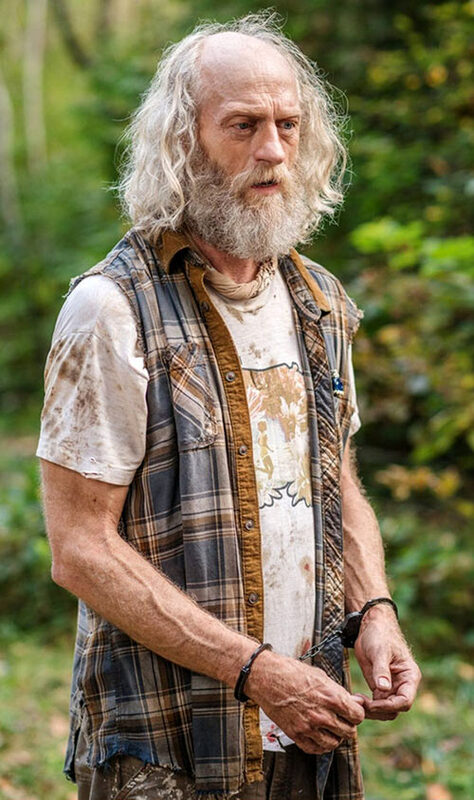 Source of Character: Z-Nation TV-series, seasons 1-4, character played by Russell Hodgkinson. Writeup completed on the 17th of May, 2018. There are now four seasons of the show; if you’re into zombies, with funny twists, this is a natural for you! And know this: it gets better and better with each season.